…and now you can too. This is quite possibly the cutest thing I’ve ever seen. Here’s an account of the origins of the phrase ‘out of sorts’. Interesting in its own right, but also because by the end of it you’ll probably be thinking what a weird word sorts is. It just doesn’t look right. Sorts, sorts, sorts. General Petraeus, the commander of all U.S. troops in Iraq, “goes out there almost every day in an unarmed humvee.” Lest there be confusion, no he doesn’t. There are neighborhoods in Baghdad where you can go for a walk untroubled, even though a recent statement from the head of the military in Iraq specifically states that this isn’t the case. if we fail in Iraq bin Laden and Zarqawi will come after us. This last one is scary, as Zarqawi has been dead for some time now. Zombie terrorists? That’s about as scary as scary get. 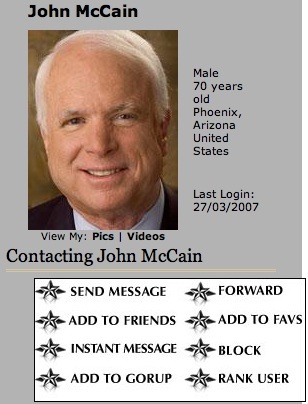 John McCain has a MySpace page. John McCain’s people skip a step or two in setting the page up. Result: McCain runs a graphic on his page saying that he now supports gay marriage, “particularly marriage between passionate females”. Update: It’s been fixed. Now you have the chance to add yourself to McCain’s ‘Gorup’. I promised a report on my experience so far with my new single speed bike, and I’m sure you’ve had a restless night waiting for an update. Well the short answer is it’s fun, but it hurts. Having a single gear simplifies things greatly. There’s no decision for what gear would best suit the upcoming hill, or whether you’re at optimum cadence. If you want to go faster you pedal faster. If you want to go up a hill you pedal harder and maybe stand up. And if you can’t keep up with the pedals downhill then you coast. The result of this is that each ride is a freeform interval training session (or fartlek, if you like rude-sounding words). I’m particularly bad at interval training on normal bikes – however much I try I end up at my normal pace – but this forces the issue because the only alternative is to walk. On the upside the simplified drive train means I can climb in a harder gear than on my road bike, even though the Raleigh probably weighs 50% more (if still only a fraction of my own lardy mass). And there’s something very liberating about just pedaling that makes it strangely appealing. Hard to define, but worth a try if you can pick up something cheap. Tomorrow: Third-rate sarcasm about health care (probably).